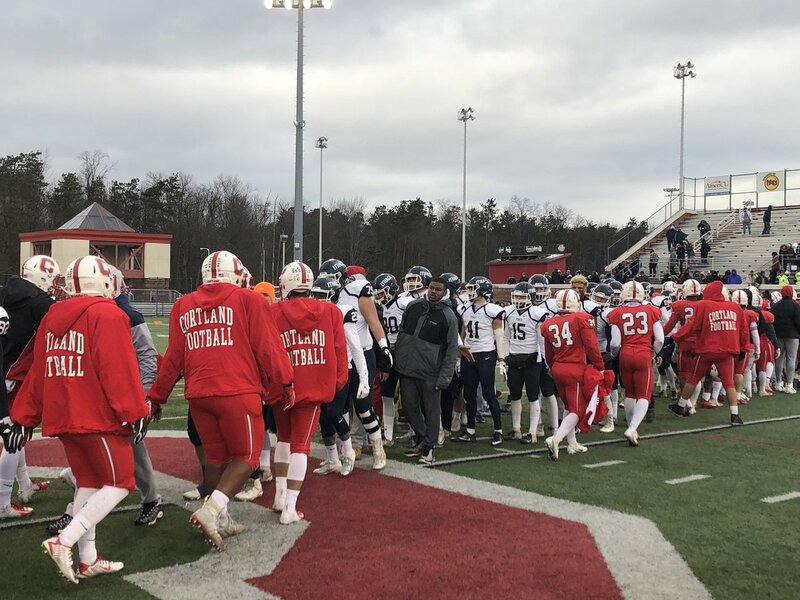 CORTLAND, N.Y. — Despite a strong effort at a comeback in the second half, the Cortland Red Dragons fell to the Ithaca Bombers, 24-21, in the 60th annual Cortaca Jug Game. The Red Dragons fall to 7-3 on the season, while the Bombers improve to 8-2. With the loss, Cortland's playoff chances remain slim, while Ithaca could potentially land an NCAA at-large playoff berth, depending on how things shape up to end the season. Ithaca got out to an early 14-0 lead by the end of the first quarter on a 1-yard touchdown run by Kendall Anderson and a 24-yard touchdown reception by Hayden Frey from Wahid Nabi. In the second quarter, Ithaca extended their lead to 21-0 after Will Gladney caught a 17-yard touchdown reception. Cortland managed to cut the deficit to 14 points after a 42-yard touchdown reception by Cortland's Nick Anderson, leaving the halftime score at 21-7. Ithaca's Brian Fallon kicked a 29-yard field goal to increase the lead to 24-7, but a 65-yard touchdown run by Cortland's Johnny Akins helped spark a Cortland comeback. In the fourth quarter, Cortland quarterback Brett Segala ran for a 9-yard touchdown to cut Ithaca's lead to 24-21 with 11:48 remaining. Cortland was unable to mount another comeback, however, and Ithaca will keep the jug.